A classic food dish, generally considered a brunch dish, that is traditionally made with layers of ingredients placed over a base of day old bread and fresh cheese, covered with a blended mixture of eggs and milk, and baked in an oven. 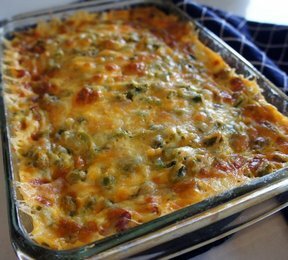 However, there are many different types of Strata that are served as main dishes, side dishes and desserts. As the versions of Strata have changed through the years, there has also been a change in the traditional ingredients with some food dishes being called Stratas that do no use bread or cheese as the base for the recipe. Also, different forms of Strata are being made that are not only prepared in casserole dishes but also in round pans both large and small. Small round Stratas are being baked that have the appearance of large muffins rather than flat casseroles. Some of the more typical Strata ingredients include meat, vegetables, potatoes, poultry, and fish. Dessert Stratas often include some type of fruit such as berries.